Workshops are scheduled Monday – Thursday at 1 pm, 2:15 pm, and 3:30pm. We are also hosting Friday webinars, online workshops that can be accessed from the comfort of your home or office with an Internet connection and phone line. 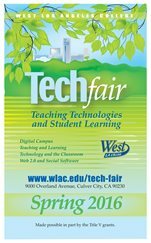 Click here to view the full Tech Fair – Spring 2016 schedule.